Canada 2005: Extra Push for Current Revival in Popularity? <b>Canada 2005:</b> Extra Push for Current Revival in Popularity? TORONTO, Canada – Monday May 29, 2006 was an interesting day for the Canadian bicycle industry. On that day the Minister of Finance was having to make a decision. Should he accept the earlier recommendation of the Canadian International Trade Tribunal (CITT), resulting from an extensive global safeguard enquiry, and place a surcharge on bicycles being imported from China, Thailand, Philippines, and Vietnam, in order to protect the domestic bicycle manufacturers once again. They had received some form of anti-dumping protection ever since the 1970’s, but this was different. On the one hand if he decided against the CITT finding he would be putting an end to bicycle manufacturing in Canada after some 130 years of proud history, putting out of work several hundred long term employees of Raleigh and Procycle employed in their respective factories in the Province of Quebec. On the other hand, if he did accept the surcharges, then the price of an imported bicycle would increase dramatically. “After considering all of the information, it was determined that temporary protective tariffs simply wouldn’t provide a competitive long-term solution. We want to grow and strengthen our economy, and imposing these surtaxes would have increased costs for both Canadian retailers and consumers,” said Minister Flaherty. He then went on to say that the new Conservative Government believed that it was a better way to reduce the General Sales Tax and some corporate taxes, provide additional support for education and skilled trades, and provide tax credits to encourage apprenticeships. The Canadian bicycle market is for almost 2 million bicycles annually. In the past this has been made up of bicycles manufactured or assembled in Canada, and bicycles, the majority of which are manufactured in China and Southeast Asia, and imported in boxes packed in ocean containers. Canadian Tire Corp, is the largest bicycle retailer in Canada with over 450 retail outlets, they are a progressive company, with high a high standard of quality control for their suppliers. Their criteria applied to all products are that products should be exciting, new, and exclusive. This had lead to their exclusive use of the Raleigh brand of bicycles and bicycle parts and accessories, as well as their own Supercycle brand, and imports, including those bearing the Schwinn name. Other large retailers of bicycles include Wal-Mart, Zellers, and Toys-R-Us supply a variety of less expensive bicycles, especially for children and young adults. 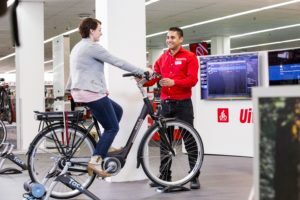 Sporting goods chains also carry a variety of bicycles and at the end of the summer they are a good place to look for a reasonable quality bicycle at a reduced price as the management try to make room for the skis and ice skates of the winter season. It is estimated that 80% of bicycles sold in Canada are bought from these mass merchants, and of that number a good 30% are supplied by Canadian Tire. This leaves the IBD’s with only about 20% of the market, however these are mostly the more expensive models. The good IDB’s also carry a good selection of parts and accessories and clothing, and most of them will have a club which they are associated with which will promote both road and mountain bike racing, and touring rides. There are not many weekends throughout the summer that an enthusiastic rider living in the area of one of the major cities cannot get out and enjoy his bicycle riding with a few like minded companions. Internationally Canada rates as one of the more successful cycling countries with spectacular mountain bike races at the Worlds Cup event at Mont St. Anne in Quebec Province, and the well supported Ladies World Cup road race which takes place every year in the city of Montreal with its tough climb up Mount Royal which towers high above downtown Montreal. Some interesting statistics from Statscan, Canada’s official recorder of import statistics, show that in 2005 of the almost 1.3 million bicycles imported into Canada, 67% of them were from China, although the total value was only 43% of the total value of imports. Similar percentages are also shown for the first quarter 2006. 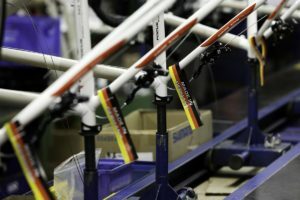 While it is very difficult to establish domestic production figures, or even establish what constitutes domestic production, with so many of the so called Canadian built bicycles being simply assembly of Chinese and Taiwanese parts, it is quite obvious that the Canadian manufacturers were fighting a rearguard battle with the imports from China and southeast Asia. The latest decision by the Finance Minister has to some extent cleared the way for another battle; this time the manufacturers will become importers themselves, and the battle will be that of name brands, and to see who can supply the best products and service to the customers. A recent poll of “the man in the street” has shown that Raleigh is still the best known bicycle name in Canada, and that the CCM name owned by Procycle is still one of the well recognized names, perhaps because of its association with ice hockey equipment, even though CCM bicycles and CCM hockey equipment are produced by two completely different companies. 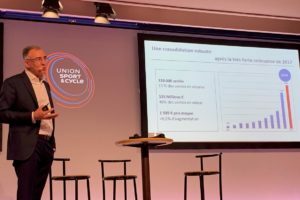 Bike Europe checked around the industry to get reactions to the Finance Ministers decision. The manufacturers were disappointed, but ready to take the next step. Adrian Marples, Sales Manager of Raleigh Canada said that the fact that Chinese exporters were getting export subsidies was still a tough fact which had to be faced. If the Canadian Government has decided to follow the US example and become a service economy, so be it. Raleigh is already prepared for this and there was no reason why they should not follow the example of Raleigh in the UK and become importers, using their strong Raleigh name and reputation to continue to do well in the market place. He believed that as in the UK Raleigh would probably start to regain market share as they expanded their product range. He expected Canadian Tire would continue to do well with Raleigh bicycles while the Diamondback name is used for the IBD’s, and some changes to the range to make it even more comprehensive would help the dealers He was concerned for some of his long-term employees, but said that Raleigh would try to do their best to help them re-establish themselves. So far they were having an excellent year. He also pointed out differences between the Canadian and American consumers. Procycle have for some time been pitching their products to the IBD’s with there well known Rocky Mountain brand of high end mountain bikes, and their comprehensive range of Miele, Italian inspired bicycles, from children’s bikes to racing bikes. They take care of the mass merchants too, with CCM bicycles being available from Toys-R-Us, The North West Company, and Wal-Mart. Another well known Canadian bicycle name is that of Norco. They do some assembly in Vancouver, British Columbia, and bring in some bikes from overseas. They have one of the most beautiful selections of bicycles we have seen and their catalogue is also a work of art and love. Norco’s Dave Overgaard reports that they have had five years of steady growth with the accent on supplying excellent value for money bicycles. They have a broad range of trekking and hybrid, mountain bike, road racing, and children’s bicycles. They also make special lifestyle bicycles, BMX, trials and jumping bikes. 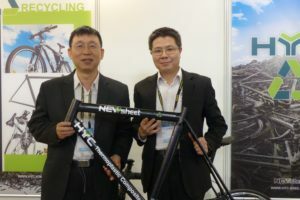 It comes as no surprise that they have found a ready market for their bicycles in Europe, Australia, and Asia, with a strong line of distributors and importers. Their latest announcement is that they are sponsoring the Canadian Symmetrics track racing team which are taking part in UCI events worldwide. Watch for the Norco track bikes on a velodrome near you! Bikes and Beyond is one of the better bicycle retailers in Winnipeg. Louis Corbeil, whose card announces him as a Bike Peddler, was enthusiastic about business. “We do well with skis and skates and clothing in the winter, but we are always happy when the bike riders come back. We had a feeling that this would be a good year for us, how many customers are looking at new bicycles in February, when the temperature is -35C? Bicycles have been selling well, we do a lot with Norco, also Giant, and Trek are good for their racing bikes. Clothing is another productive line for us, we make sure that we have enough stock in all the sizes, it seems to be the wilder the patterns the better the sales. There is no doubt that the good weather is having its effect on the business, and maybe now that the doubt about dumping duties and surcharges has been put to rest, the Canadian bicycle business can return to being a fun business, not an easy business, but fun all the same. 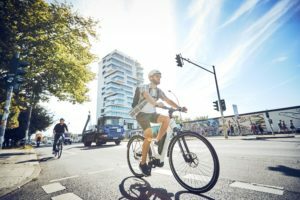 Had the CITT recommendation for a 30% bicycle surtax been implemented the effect would have been to increase the cost of import bicycles at price-points between CAD 400- 700 (€ 280 – € 490) – a market segment comprised of commuter bicycles and high quality entry level bicycles used by youths. The proposed 30% surtax would have been applied in addition to two existing protections – a 13% customs tariff that is applied to every bicycle imported into Canada irrespective of origin and special anti-dumping duties ranging from 5-50% that have been imposed on bicycles from Taiwan and China for well over a decade. The Canadian Motorcycle market is still dominated by sales of four wheeled quad ATV’s. Whether it is in the Rocky Mountains, the snow covered hills of Quebec, on a camping trip in Ontario, churning through the mud in the early Spring on the Prairies, or way up in the Arctic hunting and fishing; the ATV is the transportation of choice. There has been a revival of interest in road bikes especially in the Eastern Provinces, and Western Canada still keeps the faith with off-road motorcycles. But it is the small motorscooter which has made the biggest impact in the last few months. Inside we find a great display of Piaggio Group products ranging from the Vespa LX, via the Derbi Boulevard 150 to the PiaggioX9 500. Bill Houlbrook the sales Manager is pleased to show me around. Vespa Winnipeg is one of 25 Vespa franchise stores across Canada, they have only been open for business for less than one year, but are very pleased with their sales to date. Customers range from young college students to older or retired people who were once part of the 1950/60 European scooter boom and are looking for something to remind them of those carefree pre-mortgage, pre-family responsibility years. Bill showed me the 50cc Piaggio Typhoon, which built for the Canadian market has only a single seat with no room for a passenger. One draw back to motorcycle and/or scooter sales in Manitoba is the ever increasing cost of insurance. Manitoba insurance is administered by the Province, there is no chance to look around for a cheaper insurance, and one is sometimes lead to believe that the province would just as soon get motorcycles off the road all together. One has to be an enthusiast to ride a motorcycle in Manitoba, you must insure for the whole year, but maybe ride for half of it. Roads are long and flat and windswept, or gravel farm roads. Stops for refreshment are many miles apart. One make of motorcycle ideal for these conditions of long highway miles is the Harley-Davidson, and the cult built around the name means that Lone Star Harley-Davidson outlet on the outskirts of Winnipeg is always busy. They have the big bikes, and the chrome parts, and the clothing, all of which contribute to the Harley mystique. Vice President Marge Danylchuk tells me that business is OK. I think we know most of the Harley owners in Manitoba, and we get customers from Saskatchewan and Alberta on a regular basis. A lot of guys start off on Japanese bikes or BMW’s, but most of the serious motorcyclists come to see us sooner or later. Secretly everyone dreams of owning a Harley-Davidson.” It would appear that motorcycling in its various forms is still alive and well on the Prairies of Canada.